This morning, my 5-year-old daughter and I were taking some time to play a little game with the baby. Baby would stretch out her leg, and we could see her little foot jutting beneath the skin on my right side. My daughter would rub her foot, and we would watch as she would stick her bottom up, making a little mountain in the center of my tummy. We played with her for about 20 minutes, watching her roll from side to side under my skin, stretch out that leg and then draw it back in. Even as I watch and feel these unbelievable moments with the baby, it’s hard to imagine that we will be holding her in our arms in two weeks. How is it that a fully-formed baby somehow manages to fold herself up so tightly that she fits inside my body? But I got an unexpected gift today. I got to see her face. I know this probably looks like a grainy, black and white ultrasound photo to most people. But to me it’s an awe-inspiring thing of beauty. I can’t stop looking at those big eyes staring at me from inside my body. And her nose looks like it will be the same shape as the nose of my other children. It’s so reassuring to see that all of her organs seem to be working properly, her arms and legs are just as they should be, and most of all, to see her face. I wasn’t expecting an ultrasound today. And yet, I wasn’t surprised either. I continue to get lots of comments about how small I am. When my midwife measured me today, I was, in fact, smaller than I should be. The doctor sent me immediately to the hospital to the “old folks” maternal fetal medical center for all the AMAers like me. I had done a non-stress test earlier, and the baby’s heart rate looked perfect. But the doctor and midwife both thought it would be best to do an ultrasound. I couldn’t wait. I was needing some reassurance. It was a little unsettling to hear the nurses talking in the back about the AMA in the waiting room with the IUGR (intrauterine growth restriction). I was having flashbacks of my pregnancy with my daughter when the exact same thing happened at nearly the exact point in my pregnancy. That time, the doctor decided to do a C-section that evening. 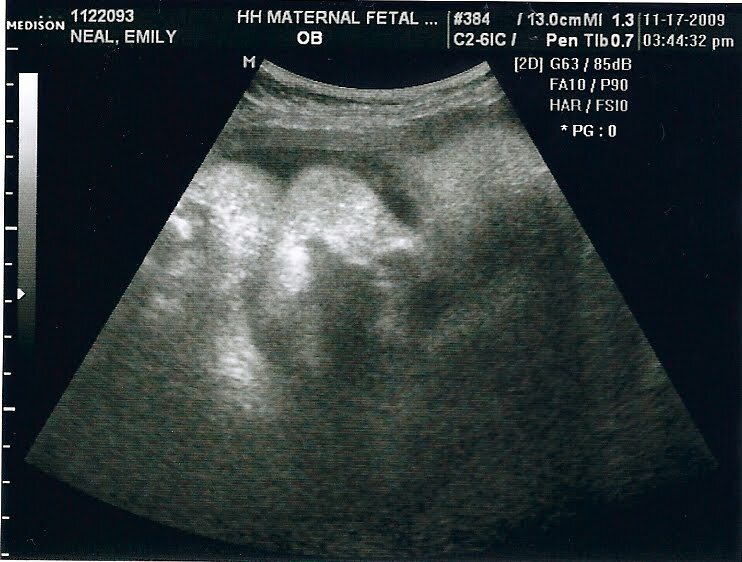 I started to convince myself the outcome this time would be the same, and I wasn’t looking forward to having a C-section today while my husband is overseas. But everything looked completely normal. The organs, limbs, brain, blood flow, amniotic fluid levels… everything was good. The baby is about 6 pounds, 1 ounce, just one ounce shy of my daughter’s birth weight. And I got to see just how tightly she is wrapped up in there. Hands in front of face. Legs curled up tight. Then for one brief moment, she lowered her hand and looked at us. So, continuing with my theme of thankfulness… I am so thankful that I got to see my baby’s sweet face today. It was a day of small miracles. How fun to get to "play" with her in the womb. It helps to think that she already knows the family and will ease her way right in when it is time. And your picture is adorable. You look content! Beautiful. That is an amazing picture of a little miracle. What a wonderful experience for you daughter to play with her like that. Simply gorgeous! I love that your daughter is so in-love already. It is so wonderful to see.